You are currently browsing the archives for the Ira Kaufman, Everything eye-RAH! category. We’re in search of the holy grail, Buccaneer style. It’s coming to a boil when it comes to how the Bucs will build their team through this important draft. And the Sage of Tampa Bay sports is all over it, and it’s all presented by Ed Morse Cadillac Tampa and Ed Morse Cadillac Brandon. Check out their fabulous April offers while you listen. Special guest Dr. David Wenk joins the fun today, always a great guest. The record will show that Gerald McCoy played his final game as a Buccaneer on Dec. 30, 2018 in a 34-32 home loss against Atlanta. Ira is not happy. But he will be Thursday night at Buffalo Wild Wings in South Tampa for the JoeBucsFan NFL Draft party. The Bucs are victims in this Schedule-Gate fiasco, but the organization isn’t blameless. 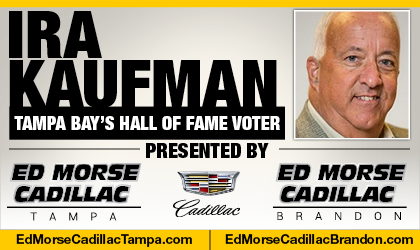 The Sage of Tampa Bay sports is shooting all kinds of insight and wisdom as the countdown to the draft — and the draft party — is on and it’s all presented by Ed Morse Cadillac Tampa and Ed Morse Cadillac Brandon. Check out their fabulous April offers while you listen. Let’s not get too cute here. Ira’s diving into all things Bucs draft and so much more, as usual. The Sage is in true midseason form today and it’s all presented by Ed Morse Cadillac Tampa and Ed Morse Cadillac Brandon. Check out their fabulous April offers while you listen. (Joe will note first that no one was harmed during the recording of this episode.) Sage Ira puts the gloves on this week when it comes to the Buccaneers’ first-round draft pick, and there’s plenty on the news of the week, as well. It’s all presented by Ed Morse Cadillac Tampa and Ed Morse Cadillac Brandon. Check out their fabulous April offers while you listen. Ira is telling stories, making demands and barking his usual Sage wisdom. It’s all presented by Ed Morse Cadillac Tampa and Ed Morse Cadillac Brandon. Shop online now while you listen! 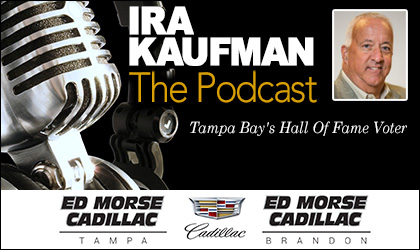 The Ira Kaufman Podcast returns to One Buc Palace and there’s plenty on the buffet. The Sage of Tampa Bay sports is putting his foot down out of the gate. It’s all presented by Ed Morse Cadillac Tampa and Ed Morse Cadillac Brandon. Check out their fabulous April offers while you listen.